A view of the front with the native rhodendron in bloom. Here is a beautiful home in a private setting with a stocked pond and 5.17 acres of mostly wooded land. The front of the 2,700 sq. ft. home. This is truly a spectacular home in the Meadows of Dan with 5.17 wooded acres, and a stocked pond. The home features a huge living room with vaulted ceilings, exposed beams, large two-story stone fireplace, hardwood floors, and lots of windows to enjoy the peaceful setting. The home has two bedrooms with room for a third, two full baths, a den, kitchen, dining room/library, and decks an porches to enjoy the natural scenic beauty. The home was built as a mountain cabin in 1974 and has been updated into a wonderful show place over the years. In 1991 there was an addition added to double the size of the home, a all new roof line, enclosed porch, new kitchen, an additional bedroom, two walk-in closets, In 1995 the current owner added an office and converted a bedroom into a masterful library/dining room, with wood floors, exposed beams a great open room that would easily convert into a master suite if needed. In 1996 the were multi-pane glass doors added and gas logs to the fireplaces. In 1997 a new front door and extensive landscaping was done as well as adding outside outlets. The year 1998 a new propane gas furnace was installed as well as central air conditioning. New widows in the baths, bedroom, library and kitchen were added as well as heat lamps in the baths were all added in 1999. In the year 2000 other updates such as multi-pane doors were added to the kitchen and den. There was a new well drilled with enough water for three households and to help keep the pond filled during the dry months. A new roof was added in 2001 and two skylights were replaced as well as the gutters. New fixtures were added to one of the baths as well as a new washer and dryer. The interior was painted and new wall paper as well as carpet was added in 2002. The kitchen was renovated in 2003 with two new sinks, countertops, laminate floor and a new range and refrigerator. New garage doors with remote openers were installed in 2004. During 2007 and 2008 the exterior of the home was given a new coat of paint. The grounds have stone walls that were hand-built, back filled with dirt and planted with ground cover. There are perennial plants and over 6,000 bulbs that bloom in the spring, a beautiful site to enjoy as the winter gives way to spring. The property also has fruit trees, Rhodendrons, shrubs, 300 Irises, 100 day lilies, and many summer plants around the pond. The pond is stocked with bass and bluegill. The house has a generator in the basement in case of loss of electricity. The home is being offered with all appliances, washer and dryer. This is an amazing home tucked in the Blue Ridge Mountains of Virginia in the community of Meadows of Dan. It's the perfect place to escape for extended weekends or a perfect retirement home with one-level living. Call us today to schedule your exclusive showing. Due to the privacy and seclusion of this property no drive-by directions or address will be given. A view of the side of the home with a lot of windows for natural sunlight. From a distance looking over the pond at the home and garage. The pond makes a great peaceful setting. The two car garage with an upstairs perfect for storage or an apartment for your guests. Thousands of blooming flowers along the stone wall. The living room with large stone fireplace, vaulted ceilings and exposed beams. The dining room/library that would make an excellent master suite. 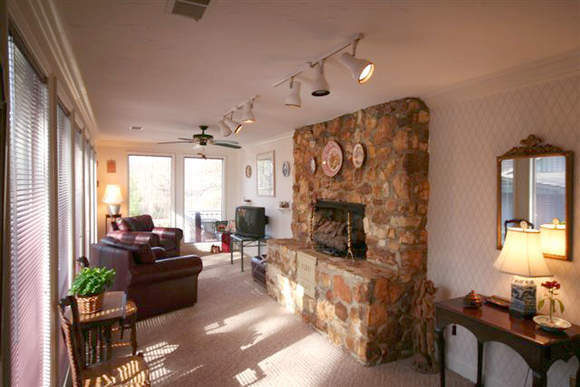 The den with lots of natural light and a stone fireplace. The kitchen with custom cabinets, tile floor and plenty of storage.